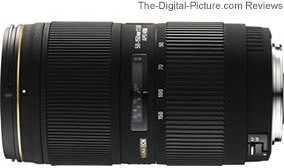 Note: The Sigma 50-150mm f/2.8 II EX DC HSM Lens has been replaced by the Sigma 50-150mm f/2.8 EX DC OS HSM Lens. The Sigma 50-150mm f/2.8 II EX DC HSM Lens is a very attractive combination of focal length range, wide aperture and size/weight. Unfortunately, focus calibration issues appear to be prevalent in this lens. All three purchased-retail-new copies of this lens I tried strongly front-focused on both my Canon EOS Rebel XSi / 450D and Canon EOS 40D DSLRs. All three focused consistently, but all focused well in front of the subject. On top of that, one lens had a smudge on an inner lens surface. Yes, there is a chance a forth copy could focus properly, but 0 for 3 is not a good showing and I have to stop somewhere. So my conclusion is that, if relying on AF, this is an extremely soft lens - unusable until f/5.6 at 50mm and f/11 at 150mm in my opinion. Let me show you. The mouseover comparison above shows the out-of-focus image delivered by the Sigma 50-150's autofocus system at 100mm - one of its stronger-performing focal lengths. The distance in this comparison was 18.7' (5.7m) from the focal plane. Even stopped down three stops to f/8.0 does not give enough DOF to correct the AF problem at 100mm. When manually focused, the Sigma 50-150mm f/2.8 II EX DC HSM Lens performs obviously better. Wide open aperture (f/2.8) images are soft - especially at the 50mm and 150mm ends of the focal length range - at f/2.8. Images shot wide open at the focal length extremes are especially soft and contrast at 150mm f/2.8 is poor. Midrange focal lengths become reasonably sharp at f/4 while the ends of the focal length range (especially 150mm) are still improving at f/5.6. Overall, the 50-150 II has a flat plane of sharp focus showing only a slight curve at the wide end; but, even sharpness around the frame was not the case and was not consistent between lenses. Sample #1 in the ISO 12233 resolution chart results corresponds to the first lens I purchased. This lens was sharpest in the top right at 50mm - the other three corners were softer but similar to each other. At 100mm, the right side was sharper than the left. Results around the frame were similar at 70mm and 150mm. Sample lens #2 was much softer on the right side than the left at 70mm and softer on the left side than the right from 100-150mm. Lens #1 was sharper in the corners at 50mm and 70mm and both were similar at 100mm and 150mm. Flare is very well controlled at 50mm and very strong at 150mm. The transition is linear over the focal length range. Distortion consists of mild barrel distortion in the center of the frame (not as strong at corners) at 50mm transitioning to near-none at 65mm. By 80mm, pincushion distortion becomes present and by 150mm, pincushion distortion is relatively strong. CA (Chromatic Aberration) is basically absent at 50 and 70mm, but starts to show in the corners by 100mm and becomes strong in the corners at 150mm. Vignetting is noticeable in the corners at f/2.8 - especially at 150mm. Most corner shading is cleared up by f/4, but 150mm likes f/5.6 for evenly-lit corners. The overall physical features of this lens are very nice - typical for a Sigma "EX" lens. Sigma's internal and rear-focusing HSM (Hypersonic motor) AF is quiet and moderately fast (the quietness makes it seem even faster). Interesting is that manual focusing this lens produces noise - a squeak like a rubber gasket rubbing inside the lens. It is not loud and not a significant issue. FTM (Full Time Manual) focusing is another available feature. The Sigma 50-150mm f/2.8 II EX DC HSM Lens is internal-zooming. Canon owners should note that the zoom ring rotates in the reverse direction of Canon's lenses. 67mm filters attached to this lens do not rotate (an important feature when using circular polarizer and split neutral density filters). Though not a feather-weight, I like the modest heft of this lens for its medium-small size. It feels solid but is not a burden to carry for long periods of time. The focus and zoom rings are smooth, have no play/wobble and are nicely sized. The design is attractive and the barrel is relatively smooth. These features combine to make the lens nice to use. The matte Sigma EX finish is not my favorite, but most of this lens is rubber zoom and focus ring. The Sigma 50-150mm f/2.8 II EX DC HSM Lens comes with a lens hood, but a tripod ring is not included or optional. Though not required, it would have been a nice accessory for this lens. This much weight hanging this far out in front of a tripod-mounted camera body is putting some torque on the tripod head. Expect a little drop after tightening all but the best heads and most-rigid bodies with this lens mounted. 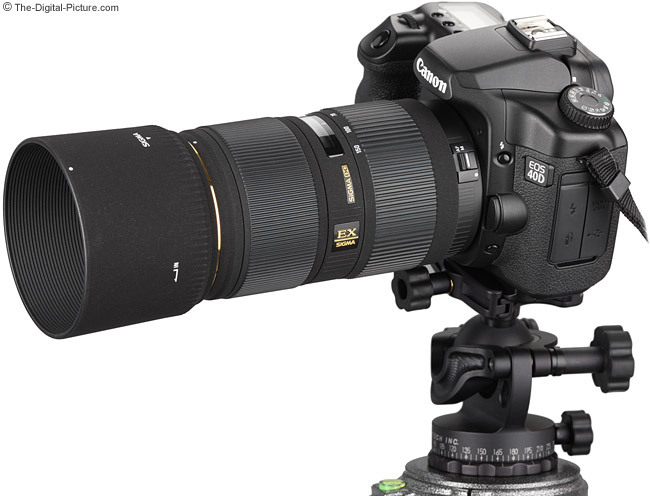 The Sigma 50-150 is shown mounted on a Canon EOS 40D DSLR in the above picture. That's a very stylish Acratech GV2 ball Head on a Gitzo GT35350LSV under the body. This combo requires an aim-slightly-high approach to lock-down for proper final image framing. 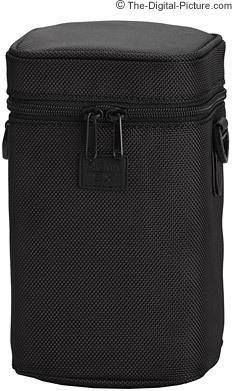 The nice padded nylon lens case shown below is provided in the box. A shoulder strap for the case (not shown) is included. Sigma's included new center & side-pinch lens caps are very nice. The Sigma 50-150mm f/2.8 II EX DC HSM Lens is not going to win any close-focusing contests though extension tubes will help in this regard. This lens is also compatible with the Sigma 1.4x and Sigma 2x Teleconverters. The purpose of the teleconverters is to give you more focal length (greater magnification), so in my logic, the results that matter most are those from the long end of the zoom range. The 1.4x did not perform well on this lens at 150mm. Even stopped down results were soft with additional CA present. I didn't test the 2x, but results should be even worse. The Sigma 50-150's focal length range falls right in line above the 18-55mm (or similar) general purpose lenses frequently used as general purpose lenses on the 1.6x FOVCF bodies this lens is compatible with. Being a "DC" (Digital Camera) lens, the 50-150 II is not full-frame or 1.3x body compatible. The 50-150mm focal length range on these bodies frames like a 80-240mm lens on a full frame body. These focal lengths are great for portraits, close to medium distance sports, kids running around, landscapes ... and a million other uses. The above focal length samples above were shot at f/2.8. The Sigma 50-150mm f/2.8 II EX DC HSM Lens is available in Canon (reviewed), Nikon, Sigma and Pentax mounts. Full disclosure: You should know that there are potential issues when using a lens made by a manufacturer other than the camera body manufacturer. Since Sigma reverse engineers (vs. licenses) manufacturer AF routines (except for their own bodies), the possibility exists that a new body might not support an older third party lens. Though not common, this has happened. Sometimes a lens can be rechipped to be made compatible, sometimes not. Again unusual is the situation where the lens and body manufacturers place fault on each other for a problem. To its advantage is Sigma USA's 4-year warranty - it is far superior to Canon's standard 1 year warranty. The risk is probably low, but you should figure this into your purchase decision. We've come a long way since the MF-only days. Using this improperly-calibrated lens for non-tripod based, non-still life photos brought back memories. Without a split-prism focusing screen, I'm not very good at manually focusing a lens. 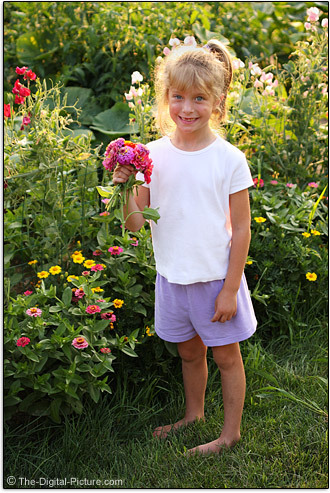 Many of my sample photos were tripod-based and focused using Live View on the LCD. Your experience may be different, but ... go forward with this lens purchase armed with the knowledge that repairs/returns are quite likely going to be necessary. These cost time - a finite resource that has value. The Sigma 50-150mm f/2.8 II EX DC HSM Lens delivers average image quality overall if it is focused properly. And that is the big if in my experience.